UPDATE 1: Fixed some of the volume issues, as well as a bug with the grapple mechanic. Some slight terrain changes have been made as well to just add some polish. UPDATE 2: Added some quality of life improvements and polished the level design a bit. It's no longer ridiculously hard to advance past certain points. 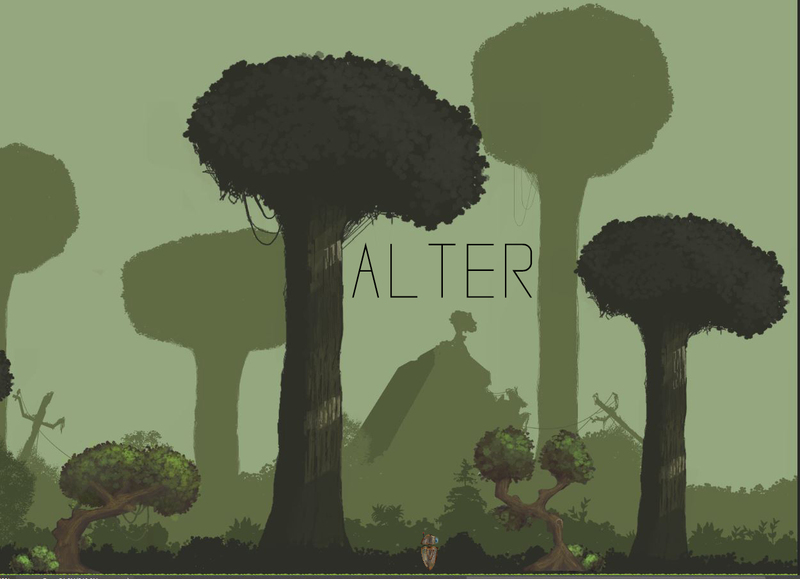 Alter takes place on a dystopian Earth where a small robot - the last of its kind - is reactivated to find itself without working parts. We incorporated the theme by use of upgrades that allow the player to traverse different parts of the map, as well as through simpler things like having colour, the ability to move left, or even just hear audio properly. We have small forms of narrative scattered around the world, and the ending is determined by whether a player explores enough or not. We hope you enjoy our game! Love the art guys! Definitely giving this one a shot/look once you give us a gameplay preview! UPDATE: We are aware that the V/O audio is a bit too soft and of a bug that needs fixing, it will be done asap and an updated link will be posted. @Nandrew If you click on the start, it should get going. The brightness might be the problem? We merely ran it on our two test systems here and it seemed fine? Otherwise if you can't seem to get it going, I'll try make the buttons more visible :) Let me know! We are aware of the start screen brightness being a little dim. Be assured that the Start button is there, and it will load the game once clicked on - even if it takes a while to load. @Nandrew have you managed to get it going? I like the gradual progression of your abilities as you go through the space. The moment I got the color upgrade was an especially cool moment. The atmosphere you've created with both the art and the music was really interesting and made me want to explore the world more. I wasn't able to figure out the other upgrades other than moving though. I hear whispers of a grappling hook? Moving forward, it could be great to have a way to replay some of the records you pick up in case people want to organise events. All in all it was pretty interesting time! @Grim thanks a lot for taking the time! The upgrades were all implemented and they work, but given the amount of time we had, I have to admit some things slipped our mind. The upgrade icons in the UI show which buttons you need to press to use them, but a clearer way of doing that would've been a better way to approach it now that I think about it. Aside from that, I was working on the level design so long, I forgot that I needed to ramp up the difficulty of what players encounter in terms of the upgrades, so the learning curve is a bit steep - especially when you get the Blink upgrade since the immediate section after that requires some precise timings on behalf of the player. In terms of a way to revisit the records, we wanted to do that, but didn't really have time to fiddle with a system for that. Definitely something we'd like to do though! All in all we had a lot of fun making this - and it being our first game jam we were happy with the result. We're already keen for the next one! This reminded me of DLC Quest. The controls worked great for me. The music was a tad soft. I hope you take this further! Excellent work. @konman thanks for taking the time to play Alter! We had a lot of fun putting it together. As for the music, was it too soft prior to, or after picking up the audio upgrade? Just after the colour one - rather soon-ish after - you'll run into the one that removes the distortion from the sound and adds a little antenna to the character so you can properly hear the music and voice-overs. I'm tweaking some of the level-design elements, because we realised a lot of it is much harder than we intended, so people tend to get rather frustrated with it. I'll have the new update uploaded in a few minutes! Latest version has been dropped @vince @SUGBOERIE if you guys haven't checked it out yet! I seem to collect this blue orb, and this grey-red coil, but I don't know how to use them. I don't know what they are. Should I be able to use them? Liked the upgrade to the colours. I got another upgrade which made a sound when I jumped (and I think the music became louder). Is that the audio upgrade (it looked like a spring with a red ball). I was hoping that upgrade was an improved jump as there appeared to be a lot of places I couldn't reach yet. I really liked the first part of the game with getting upgrades to move backwards and then to jump. I feel like that part of it could have been a bit longer (with a little more story in between) with the spacing between the later upgrades a bit more condensed. I guess I'm saying, I felt like the jumping platforming problems might have repeated a bit too much, when all I could do was jump and move (with no wall climb or double jump or other movement options to strategize around). But the growth of abilities at the beginning felt really good and fresh. The game has great mood as well. It creates a mysterious and somewhat tragic ambiance and made me feel curious about where it was going. Thanks so much for the review, @EvanGreenwood! The red coil is indeed the audio upgrade - and granted given more time we could've solidified the mechanic a bit more. The reason we didn't space the starting movements out too much was because we were afraid that would become tedious, but it makes complete sense to try and find a balance between the two - being that it either happens too quick or takes too long. The double jump is actually acquired a bit later, and we had quite a few brainstorms around when the player should unlock it, but we have had quite a few of our friends tell us that the respawns become rather frustrating as it makes the game's progress really slow in certain areas. Thanks again for taking the time, we appreciate it a lot!